dust raised by Vibroseis trucks on field roads and in rainless periods. Seismic teams travel twice a day (to the seismic line and back to seismic base). The trucks move one after another along the seismic line. Emissions during the travel are low and may vary in time and from one location to another. The impact is comparable to that of vehicular traffic and operation of agricultural machines in the field. traffic of vehicles and operation of engine-powered machinery (e.g. 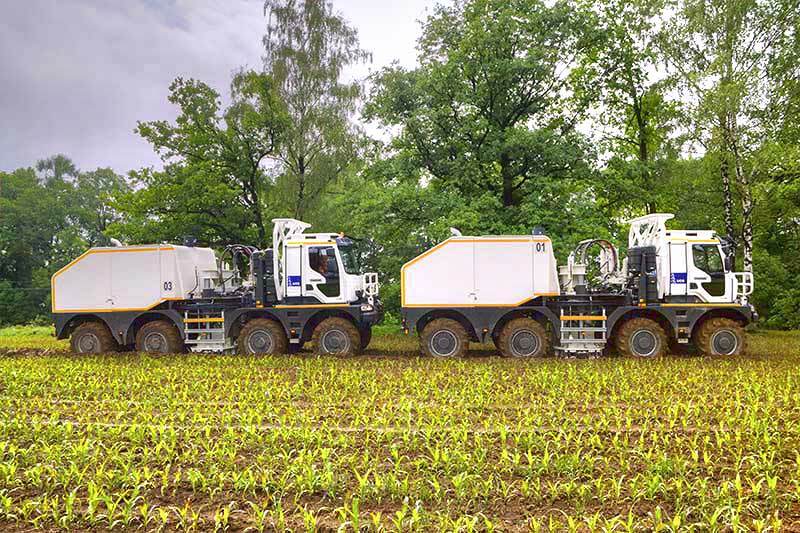 truck-mounted rigs for shot hole drilling, water delivery trucks, recording systems, measuring equipment, etc.). The explosion occurs under the ground (usually at a depth of 2 to 6 metres, exceptionally 10+ m). If properly delivered, explosion does not involve any emissions to the air. Normally, it takes 4 – 6 weeks to build the drill site. dust raised during earthwork, for example site leveling or the building of embankments around the site. Impacts on the air are of a short duration at site development stage and will cease on completion of construction works. Well drilling is the next stage. Normally, it takes 3 to 8 weeks to drill a well. Drilling operations are delivered on a continuous basis, i.e. round-the-clock and seven days a week. on-site boiler for heating rooms and water. Key emissions at this stage are: dusts, sulfur dioxide, nitrogen oxides and carbon oxide. A single fracturing procedure is usually of a short duration (a few hours) and it takes a few or several days to complete the entire process (involving a few or several procedures). Breaks of a day or a few days (a few or several dozens of hours) may occur between individual procedures. Fracturing jobs are followed by tests that are intended to estimate productivity and production parameters of the well. Well testing duration may vary, but most often it takes 3 months to complete the tests. The purpose of the test production is to establish the rate of gas production and its decrease with time. Test production under a concession for oil and gas exploration and appraisal may be conducted for a period of several months and up to two years (in accordance with Geological and Mining Law). Gas extracted at test production stage may be delivered to the local distribution network for commercial use. Natural gas is flared to avoid a release of gas components (methane in particular) to the atmosphere. Chief emissions at the stage of well testing and test production are: dusts, sulfur dioxide, nitrogen oxides and carbon oxide. On completion of operations the rig will be removed and the site cleared and reclaimed. Is it possible to minimize the emissions of air pollutants in shale gas exploration and if yes, then how? application of efficient equipment in accordance with its intended use. Dust and gas emissions to the air from shale gas exploration well drilling are comparable to those that occur at drilling conventional gas exploration wells. Time is the only difference, as it takes longer to drill a shale gas well with a horizontal leg and perform operations in the borehole, such as hydraulic fracturing. General Directorate for Environmental Protection made available online the English versions of the reports on the results of environmental studies delivered at shale gas exploration in Poland. What potential effect shale gas exploration/production may have on the status of groundwater?